We Do So Much More than Just Shrink Wrap for Boats—Take a Look! Here in the Chain O’Lakes region, shrink wrap for boats dominates as the most common type of project that we get. However, don’t think that’s the only type of job you can come to us for! Our portfolio is a lot more diverse than you might expect. Unlimited Shrinkwrap has supplied the community with quality shrink wrap services for over a decade, including shrink wrap for boats, planes, cars, furniture, industrial machinery, and more. 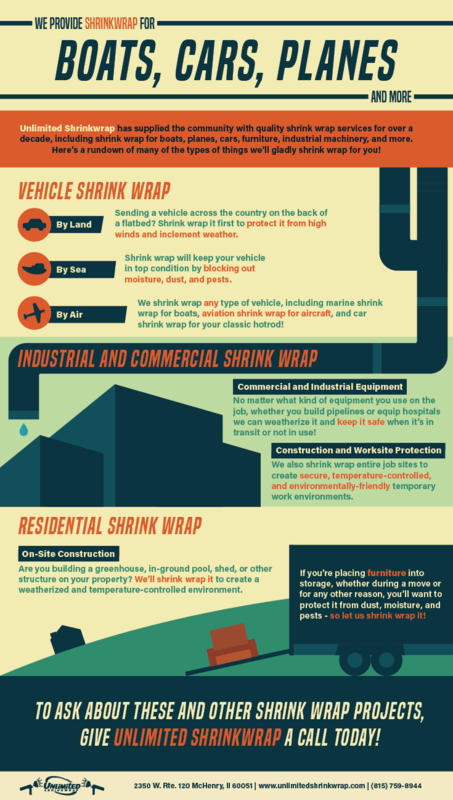 Here’s a rundown of many of the types of things we’ll gladly shrink wrap for you! By Land, Sea, and Air: We shrink wrap any type of vehicle, including marine shrink wrap for boats, aviation shrink wrap for aircraft, and car shrink wrap for your classic hotrod! Shrink wrap creates a durable seal without extra space, helping protect any vehicle from corrosion, bugs, rats, mold, and more. Winterization: Placing your boat or car into storage for the winter? Shrink wrap will keep it in top condition by blocking out moisture, dust, and pests. Shrink wrap for boats is the best way to ensure a painless start to the boating season the following spring! Transportation Shrink Wrap: Sending a vehicle across the country on the back of a flatbed? Shrink wrap it first to protect it from high winds and inclement weather. The drum-tight seal means less wind resistance and less trapped dust and moisture compared to a regular tarp. Commercial and Industrial Equipment: No matter what kind of equipment you use on the job, whether you build pipelines or equip hospitals, we can weatherize it and keep it safe when it’s in transit or not in use. We can shrink wrap objects of nearly any size—even including power plant machinery or jet plane components! Construction and Worksite Protection: We also shrink wrap entire job sites to create secure, temperature-controlled, and environmentally-friendly temporary work environments. Shrink wrap your work area and you can worry less about containing dust and sediment, maintaining stable temperatures, and preventing break-ins. Furniture: If you’re placing furniture into storage, whether during a move or for any other reason, you’ll want to protect it from dust, moisture, and pests—so let us shrink wrap it! This is the best way to shield it from termites, rat droppings, swelling and warping, and more. On-Site Construction: Are you building a greenhouse, in-ground pool, shed, or other structure on your property? We’ll shrink wrap it to create a weatherized and temperature-controlled environment. Just like for the construction shrink wrap, this is a great way to contain dust and sediment and maintain stable temperatures while working. While boat shrink wrap in McHenry, IL and the Chain O’Lakes is our most common type of project, we do so much more than that. To ask about these and other shrink wrap projects, give Unlimited Shrinkwrap a call at 1-815-759-8944 today—we’re always excited to see what you’ll bring in for us next!